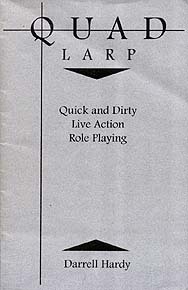 Just as the name says, QUAD is a quick and dirty system for live roleplaying. This means that task resolution is fast and intuitive (quick) with more emphasis on ease-of-play and drama than painstaking realism (dirty). There are no charts to consult or long lists of adjectives to memorize. In a word, QUAD is easy. QUAD is also versatile. It is a "generic" system, usable in any setting or genre. Furthermore, the system is designed to work for either "theatre" or "live combat" style games. Whether you want to do gritty film noir, futuristic space opera or vampiric politics, the QUAD system can handle it.